What a fantastic story!!! And the author’s narration of the audio book was absolute perfection. Don’t miss this one!!! I love to read but I am not a huge fan of audio books. With a few exceptions (Robinne Lee’s ‘The Idea of You’ and Cat Porter’s ‘Lock & Key’), I usually prefer to read at my own pace. Well if you are looking for a STUNNING audio book, grab this one! Ms. Steadman’s narration is pure gold. I couldn’t wait to start my morning commute just so I could listen to this story. I loved the story. Erin and Mark are a London couple who are just starting their life together. Erin is a documentary filmmaker who is in the process of making a film about the lives of several prisoners. I loved how each person came to life through the voice of Ms. Steadman and I was fascinated by each of their stories. Although Mark, an investment banker, suddenly loses his job, they both decide to take their planned honeymoon to Bora Bora. I literally felt as though I was staying at the Four Seasons resort with them! The details are fantastic. While diving one day, Mark and Erin make a very surprising discovery, which will change both of their lives forever. What would you do if you found priceless treasure? Would you keep it for yourself? This books takes the reader on a roller coaster of emotions and events that rocket from one shocking discovery to the next. There are so many twists and turns to this story that I was thrown off the trail several times. I did not see the ending coming and was completely taken by surprise! I can still hear those words in my head!! I am trying to keep this review spoiler-free since I knew nothing about it going in. Erin and Mark handle their situation very differently which added to the enjoyment of the story. I cannot believe this is Ms. Steadman’s debut novel! I also became very attached to the supporting characters in this story and became very invested in the story lines involving the prisoners who were the subject of Erin’s documentary film. I did not receive a review copy of this book but I did use an Audible credit for the audio book. Although this book is tad pricey, it is worth every penny. Once you start this one, you will not be able to walk away until you are finished. 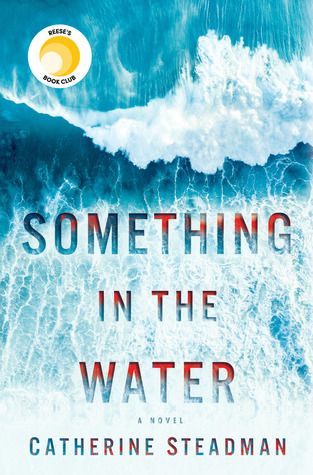 I hope Ms. Steadman writes more thrillers because ‘Something in the Water’ was a completely and utterly enthralling! I loved this book I will have to listen to it!